Two years ago, I began receiving daily e-mails requesting reprints of my articles on exosomes, details on experimental protocols, and advice on the purification and characterization of the vesicles. Having studied exosomes for more than 10 years, I thought I knew all the other researchers working on the subject, but the requests were from groups I hadn’t heard from before. The flood of inquiries made me realize that the field had been growing, attracting the attention of more and more researchers over a relatively short period of time. 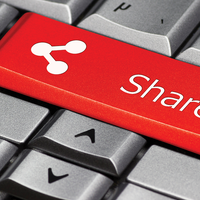 A quick glance at the literature confirmed the trend: while only about 20 PubMed-referenced papers containing the word “exosomes” were published in 2003, and just over 60 in 2007, nearly 500 exosome studies have been published since. To take advantage of this flood of research I organized an international workshop on the subject together with Graça Raposo, who in 1996 discovered exosomes made by immune antigen-presenting cells. A 2005 meeting organized by the late Rose Johnstone, who participated in the first description of exosomes in the 1980s, had drawn 25 scientists to Montreal, Canada; the new meeting, which took place this January at our home institution, the Curie Institute in Paris, attracted nearly 10 times as many attendees. At the meeting, researchers in fields ranging from immunology to neurology and tumor biology presented their recent findings on exosomes and other types of secreted membrane vesicles, including the ability of pathogens to manipulate host exosome activity and the influence of the vesicles on allergies. We also discussed potential clinical applications, such as their use as biomarkers or therapeutic tools. 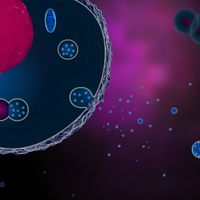 Exosomes are small in size (around 150 nm in diameter or smaller) and are secreted by most cell types. They are formed inside the cell in compartments known as multivesicular endosomes (MVE), which take up bits of the cytoplasm and its contents into membrane-bound vesicles. MVE were originally thought to merely help traffic extracellular molecules to lysosomes, where they are degraded. But about 25 years ago, researchers described the opposite process—MVE in developing red blood cells fused with the plasma membrane and released their contents, including numerous small vesicles (later dubbed exosomes), outside the cell. 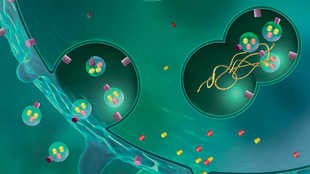 Over the past few years, the development of large-scale protein analysis techniques allowed researchers to detail the type of cargo transported by exosomes.[4. S. Mathivanan, R.J. Simpson, "ExoCarta: A compendium of exosomal proteins and RNA," Proteomics, 9:4997-5000, 2009.] 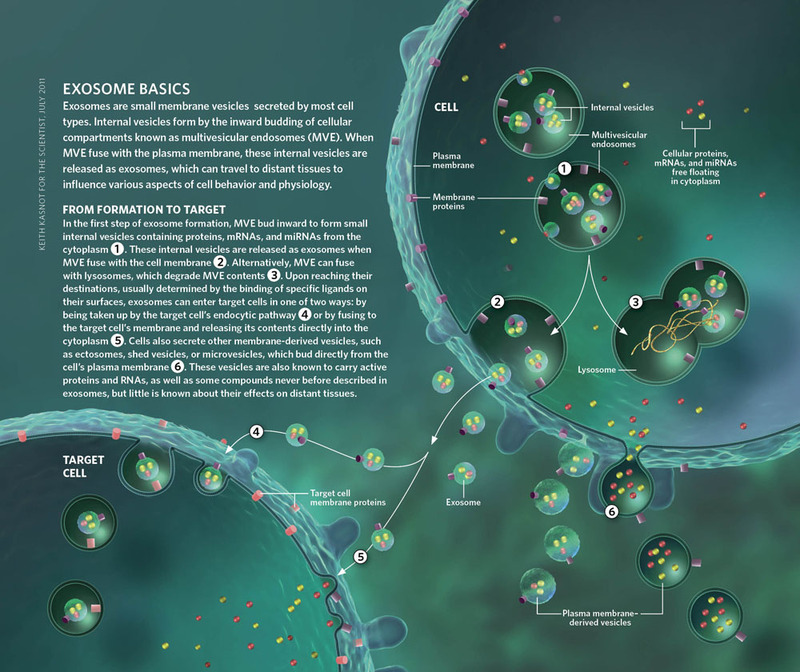 Different cell types secrete exosomes that carry specific sets of proteins that differ from the proteins contained in the membrane vesicles released by apoptotic cells, suggesting that exosomes are actively secreted by living cells. The signal for secretion is unclear, though some cell types seem to release these vesicles without any apparent provocation. Other cells, however, such as B and T lymphocytes, only secrete measurable numbers of exosomes when stimulated by the binding of a cell-surface receptor. In 2007, a group led by Jan Lötvall in Sweden discovered messenger RNA and microRNA inside exosomes.[5. H. Valadi et al., "Exosome-mediated transfer of mRNAs and microRNAs is a novel mechanism of genetic exchange between cells," Nat Cell Biol, 9:654-59, 2007.] Moreover, in vitro experiments showed that the mRNA could be translated into proteins in target cells, providing the first demonstration of genetic information transfer by exosomes. This remarkable discovery not only indicates a new form of intercellular communication, but suggests that exosomes could perhaps behave similarly to viruses, in the sense that they bring with them genetic material that is translated to proteins in the cells they “infect.” This discovery, and the concomitant development of research on microRNAs, has sparked the recent boost in the study of exosomes, the surge in publications, and the packed house of researchers eager to share their most recent findings at the International Workshop on Exosomes in January. The changes induced by exosomes upon interaction with recipient cells can vary widely depending on the type and physiological state of the secreting cell, and can either help ward off disease or, in some cases, exacerbate it.3 Mature dendritic cells, for example, secrete exosomes that carry antigens or contain MHC-peptide complexes embedded in their lipid bilayer, and can induce antigen-specific immune responses. On the other hand, exosomes secreted by mouse dendritic cells subjected to immunosuppressive agents in culture can promote immunological tolerance. Similarly, macrophages infected with nonpathogenic mycobacteria release exosomes that have been shown to bear bacterial antigens, which then are taken up by other antigen-presenting cells and promote immune responses. In contrast, exosomes released by macrophages infected with pathogenic strains of mycobacteria inhibit macrophage activation and cytokine secretion, thus dampening the immune responses that would otherwise be induced against the mycobacterial antigens. The pathogen appears to have evolved to advantageously manipulate the host’s immune system at the level of exosome communication, though the details of this subversion remain to be elucidated. Exosomes secreted by cancer cells carry antigens from the tumors, and can be captured by dendritic cells and used to present tumor antigens that would activate immune cells against the cancer. However, these exosomes also contain various immunosuppressive molecules, which can inactivate T lymphocytes or natural killer cells, or promote the differentiation of regulatory T lymphocytes or myeloid cells, which suppress immune responses. It’s unclear whether the net result of these contradictory effects will be beneficial or detrimental to an individual with cancer. Several groups have suggested that secretion of exosomes by tumors promotes their growth by inhibiting antitumor immune responses, or by promoting angiogenesis or migration to other parts of the body in metastasis.[6. M. Iero et al., "Tumour-released exosomes and their implications in cancer immunity," Cell Death Differ, 15:80-88, 2008.] But even if exosomes from tumors are found in the circulation of cancer patients, this could simply be the result of tumor expansion, and may not mean that the membrane vesicles are actively involved in tumor progression. The demonstration of a tumor-promoting function of tumor exosomes in cancer patients is still lacking. Other tissues or cells also secrete exosomes bearing immunosuppressive molecules. Placenta-derived vesicles found in a mother’s blood, for example, bear inhibitory ligands for natural killer lymphocytes and other immune-system components, which possibly prevent immune attack on the fetus. Similarly, exosomes and other vesicles present in the bronchoalveolar fluid can transfer resistance to an allergen to other animals. When exosomes purified from mice that had been tolerized to an allergen were injected into naïve mice, the allergy-prone mice became resistant to an allergic reaction. On the other hand, exosomes in bronchoalveolar fluid can also increase pro-inflammatory responses, as when exosomes purified from asthma patients are cultured with airway epithelial cells, which respond by secreting pro-inflammatory cytokines. Eukaryotic parasites or pathogens have also recently been found to secrete exosomes,[7. J.M. Silverman et al., "Leishmania exosomes modulate innate and adaptive immune responses through effects on monocytes and dendritic cells," J Immunol, 185:5011-22, 2010.] 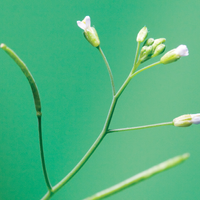 which can contribute either to tolerance of an invader (by dampening immune response), or, conversely, to pathologic inflammatory reactions to its presence. 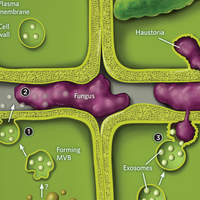 Furthermore, distinguishing exosomes from other secreted vesicles, called ectosomes, shed vesicles, or microvesicles—which bud directly from the plasma membrane (see above figure)—has been a long-standing challenge for researchers. Like exosomes, membrane microvesicles contain various active molecules, such as cytokines, growth factor receptors, and RNAs, but they also contain compounds that have not been described in exosomes, such as metalloproteases—enzymes that degrade extracellular matrix components and participate in tumor metastasis. Exosomes can be separated from vesicles of different sizes using ultracentrifugation at different speeds, with the larger vesicles pelleting at lower speed than the smaller ones, but similar-size vesicles of different intracellular origins (e.g., exosomes and certain plasma membrane-derived vesicles) are not separated by this method, making it difficult to identify the effects unique to exosomes. Research on secreted membrane vesicles and their roles as intercellular messengers is a very exciting field, with new ideas, hypotheses, and questions coming up faster than answers. The 2011 International Workshop on Exosomes allowed most of the long-term exosome and vesicle aficionados to meet, exchange ideas with many newcomers, and point out current problems in techniques, definitions, and characterizations. A final discussion session ended with the decision to carry on the momentum from this very productive workshop by setting up future annual meetings, virtual spaces to encourage further discussion, and a scientific society dedicated to the study of exosomes and secreted membrane vesicles. To that end, the next workshop is scheduled for April 2012 in Gothenburg, Sweden; a Facebook page (called Exosomes, microvesicles and other secreted membrane vesicles) and a website for comparison of exosome protein and RNA compositions is now up and running, and the rest will hopefully soon follow. Clotilde Théry is PI of the research team "Exosomes and tumor growth" at the Institute Curie in Paris, France.